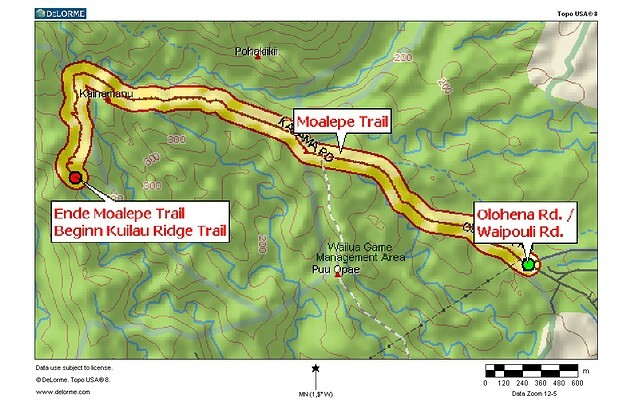 The Moalepe (chicken comb) Trail, located on Kauai’s east side, follows the old Moalepe Road from the continuation of Olohena Road beyond Waipouli (dark water) Road. The trail goes across Moalepe Ridge to a footbridge over the headwaters of Ōpaekaʻa (rolling shrimp) Stream, which serves as the dividing line between Moalepe and Kuilau Trails. The first half of the trail is more of a road through fields, but eventually transitions to a true trail as it gains elevation. Wildflowers bloom almost year-round along this trail. The six- to eight-foot yellow giants below (which have long defied my limited ability to identify them) stand behind the parking area across from the trailhead. Smaller flowers that lie along both sides of the trail, as well as up the center strip, fall into the weed category, but are nonetheless quite pretty in bloom. If anyone can identify these two ankle-high weeds, or the giant yellow flowers above, I and maybe many others would be delighted. Orchids are chief among the easily identifiable delights in the first mile of this little hike. First, within a quarter-mile of the trailhead is the Bamboo Orchid, Arundina graminifolia. In late spring/early summer, strawberry guava (psidium cattleianum) blooms, and the first fruits appear in mid to late summer. 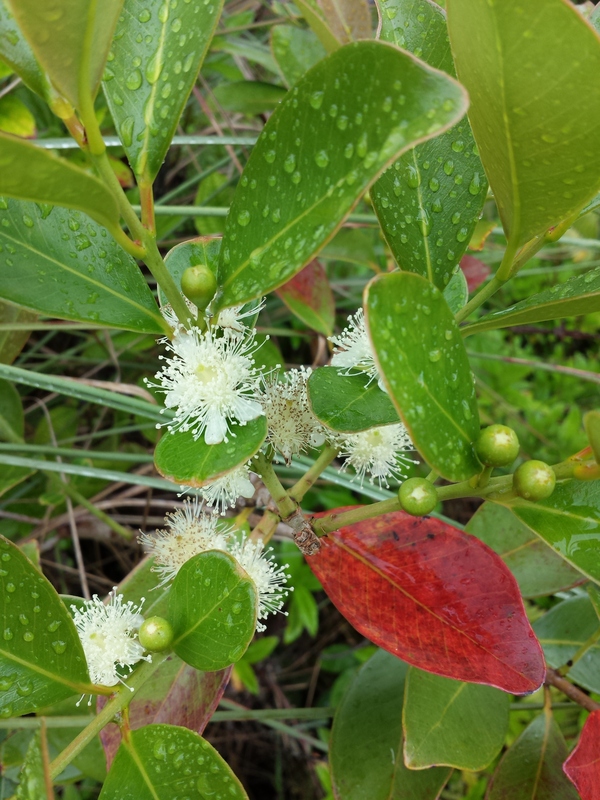 Strawberry guava are edible, but hikers are asked not to spit seeds on the ground as it’s an invasive species that consumes one-third of the rainfall and upland mists on which Kaua’i depends for drinking water. At about the half-mile marker, there’s a less problematic, and sweeter fruit growing low to the ground. This little briar was introduced to the island, but is not as invasive as the strawberry guava or Malaysian blackberry, and the fruit is more scarce. Hikers may also encounter a second orchid variety between half-mile and three-quarter-mile markers, the Philippine ground orchid (Spathoglottis plicata). 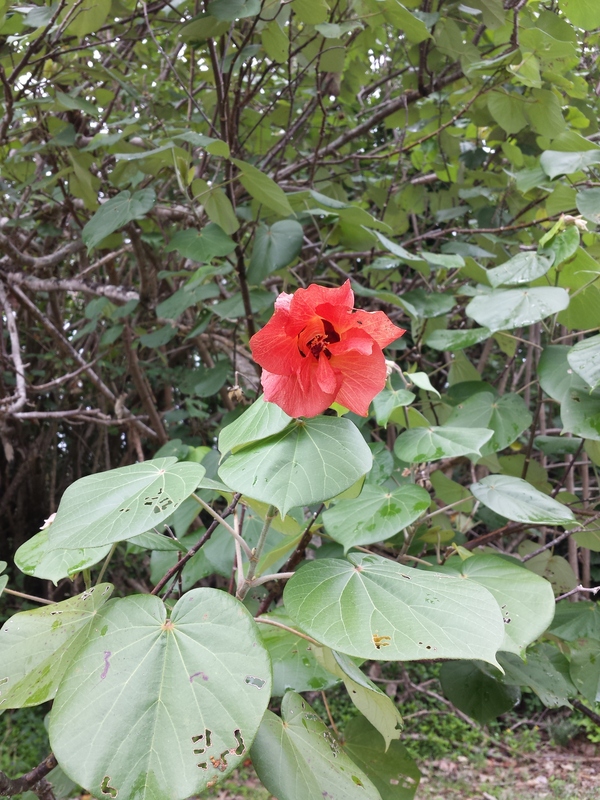 On one hike I blundered onto this gorgeous specimen of the hau (hibiscus tiliaceus), The blossoms of the hau tree transition daily from yellow in daylight to crimson by night. This flower below obviously missed the roosters’ call. Another of the dazzling, low growing weeds that often fills in between and beneath others is variously called whiteweed or flossflower (Ageratum spp). As shown below, it’s white in the bud and varies from blue to lavender after it opens. Similar to the story of the ugly duckling, what begins as a common weed becomes a flower in maturity. Owing to a rapid change in the weather, I was only able to complete half a hike on my last trip to Moalepe, but captured the change just beyond the one mile marker. This is approximately where the road truly becomes trail as one leaves pastureland behind and enters the Kealia Forest Reserve. 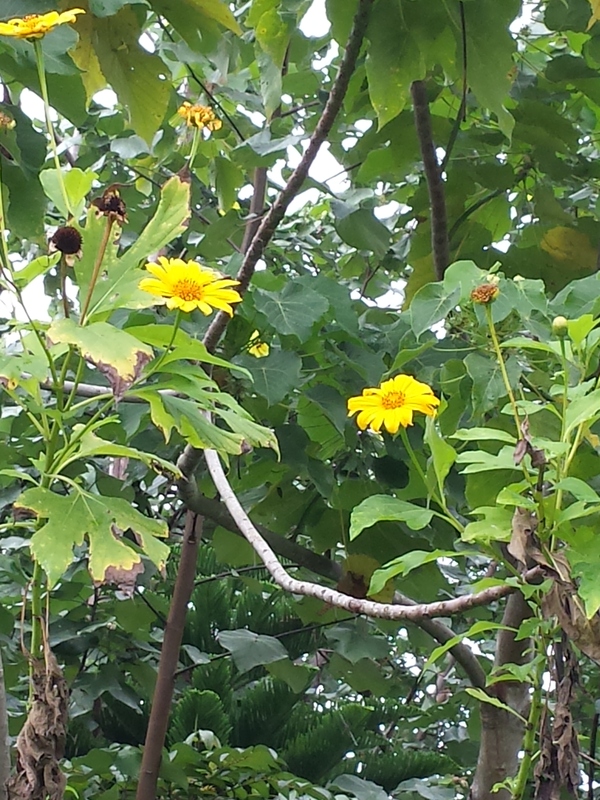 Stay tuned for Moalepe Trail (Part 2) which will show off the other half of this gentle hike. Do they dig up the invasive species. We have a huge problem here in Florida that was made worse by the hurricanes in 2004 which spread the seeds far and wide for a large variety of invasive species. My cousin’s wife works for the park service and they are constantly removing plants as they find them. Also have a huge problem with pythons in the everglades and multiple types of lizards including Tegus (up to 5 ft) Green iguanas( up to 6 ft), Nile monitors and many others. Some escaped during Hurricane Andrew and others were let loose by their owners. I know when I was in Hawaii, people had tried to smuggle snakes into the islands. Crazy! I’m not sure what the Department of Land & Natural Resources is doing to combat invasive species. I know that digging up Strawberry Guava would create more problems than it solves because it would destabilize many slopes on which it grows, generally increasing soil erosion. Fortunately, the ‘maroons’ that would smuggle snakes into Hawaii continue to be caught, knock on wood.